Made from natural rubber latex with a pure cotton flocklining, the Ansell Universal Plus 87-650 Chemical-Resistant Gauntlet Gloves have been designed to provide comfortable protection against chemicals. These gloves are ultra-thin to enable good tactile sensitivity for precision tasks and handling, and are textured to enhance grip in both wet and dry conditions. As a result, they are ideal for a range of applications in janitorial and maintenance services, in the chemical and automotive industries, and oil and petrol operations. 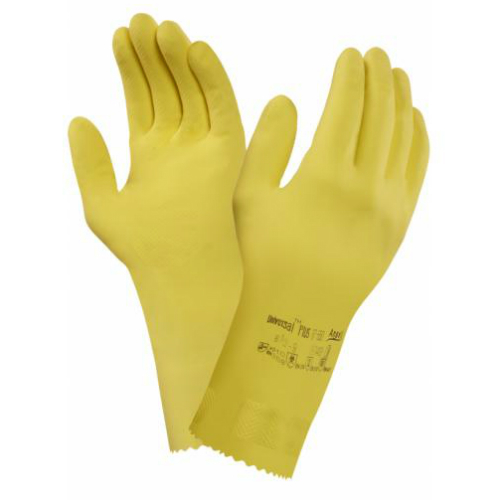 The Ansell Universal Plus 87-650 Gloves are made from natural rubber latex that has been treated to reduce the risk of allergic reaction. With a thickness of only 0.40mm, these gloves provide exceptional tactile sensitivity, which makes them suitable for a variety of manual handling and precision tasks. The Universal Plus Gauntlet Gloves have fishscale texturing on the palms and undersides of the fingers. This provides enhanced gripping ability to increase safety and reduce hand fatigue when handling material and performing tasks. The table below shows the test results of the 87-650 Chemical-Resistant Gloves according to EN 388:2016 Mechanical Risk specifications. These gloves are available in a range of sizes, making them suitable for most users. Please consult the table below for details, then select the required size from the drop-down menu at the top of the page. The gloves have a length of 305mm and a thickness of 0.40mm.